Works of Fiction by S. Burke. – Welcome to the World of Suzanne Burke. Works of Fiction by S. Burke. GENRE: Thriller, psychological, suspense. “Acts Beyond Redemption.” Book 1 of the (Unintended Consequences) series. 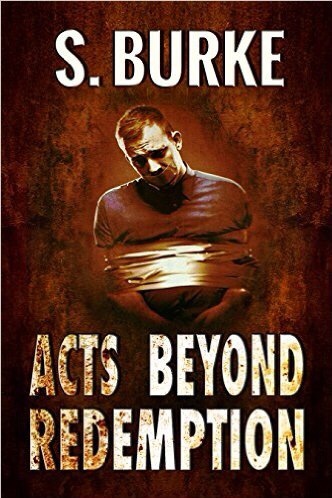 Acts Beyond Redemption is exactly the kind of book that I love to read, and Suzanne Burke is exactly the kind of author who turns me into a raving fangirl. I like reading books about serial killers, especially when the killer is unusual in some way, or turns out to be someone completely unexpected. Is Sheila responsible for numerous grisly murders, or is it someone else? This book is a must-read for anyone who enjoys great thrillers that cross the line onto the dark side! This is not a tame little read with a few twists thrown in here and there. This is an intense, complicated story that will keep you guessing all the way through. The characters are well-developed, and quite engaging. Even the “bad guys” are likable on one level or another, depending on how you see them. All in all, Acts is a book that I highly recommend, and I can’t wait until I’m able to read the sequel. Suzanne Burke is a highly talented author, and there is not a doubt in my mind that she will be around for a very long time. Just one of the 5🌟🌟🌟🌟🌟BOOK REVIEWS for ACTS OF BETRAYAL. Acts of Betrayal is a psychological thriller and adventure tale that will keep you turning the pages. Be forewarned the book has a complex plot with many moving parts and a large cast of characters to keep track of, a book truly written in a Robert Ludlum-like style. With many twists, turns, and subplots the story will keep those whose reading tastes run to this type of novel on the edge of their seats. The characters are both authentic and fully developed. The scenes describing covert operations of government agents are credibly written. There is plenty of action and intrigue, more than enough to satisfy the most discriminating psychological thriller fan. The author leaves you guessing right up to the very end, and after reading the conclusion, you’re left with sort of an ah-ha moment where you realize the book ended in exactly the way it had to. Acts of Betrayal is an entertaining read sure to please. HAS YOUR MIND BEEN SHAFTED? … ARE YOU CERTAIN?